To those that say they can only sew a straight line, this project is for you. This is a super simple way to knock yourself up a new top or beach throw, using something you most probably already have. For some reason, I had a bit of a love affair with sarongs when I was in my early twenties. I now have a stash of them – and I never use them. So I decided to whip up a beach cover-up using one. Unfold it and cut the sarong in half. You will still have a slight crease mark which will indicate the middle. You will need to finish the edges just cut. You can do this with an overlocker if you have one or you could roll hem or bias bind. Place the two pieces of fabric together, right sides facing. Measure 17cm out from the middle crease on each side. Pin. Stitch across about 5cm – 6cm on each side. This will give you an opening for your head and catch the tops of the sleeves. Turn right side out. You may want to cast a few hand stitches to help the resultant neckline sit nicely. Note where you would like your side seams. Pin. Take off and stitch the side seams, leaving about 30cm at the top, which will be the arm holes. I also left a gap at the bottom, giving side slits, which meant that I sewed about a 30cm seam. 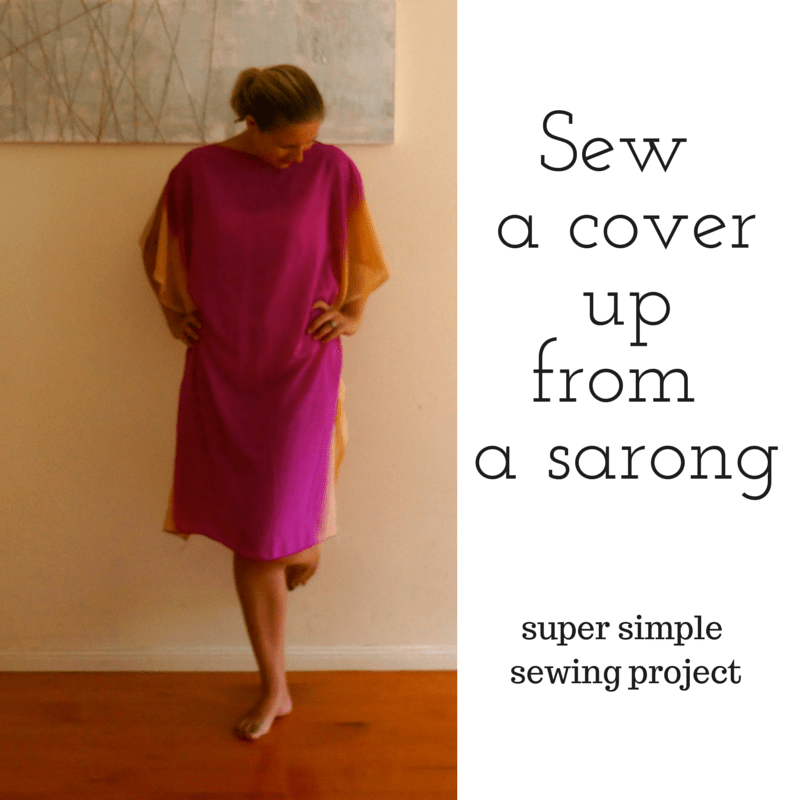 Voila – a ten minute sewing job and a cool new beach cover! I love that! Isn’t it great seeing boys get creative with sewing? Clever clogs, although I don’t sew! I do have a fab swimming cover thingee from mum – LOVE IT! OH – clever. I have a heap of sarongs that I should do this too! Getting so much more wear out of it like this then I ever did as a sarong! Pingback: 31 Days. 31 Frocks. 31 Ways. Frocktober.